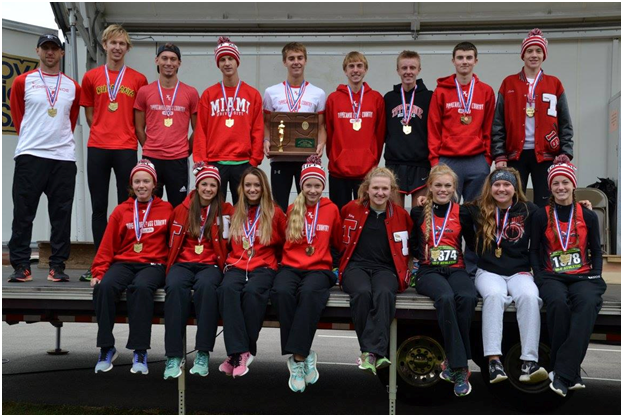 The 2015 cross country season came to an end on Saturday, with both the boys’ and girls’ teams finishing as state runners-up in Division II. For the boys’ program, it was the fifth time that the Red Devils have fallen one spot short of the title (’74, ’75, ’08, ’13, ’15) and the fourteenth state finals appearance overall. For the girls, it was the highest team finish in their history, surpassing the 2013 squad’s fifth place showing, and their fourth time participating in the championship. The boys’ team was paced by senior Mitchell Poynter, who ended his career as the state individual runner-up and recorded a personal best of 15:24.1. By virtue of his spectacular race, Poynter earned his second All-Ohio laurel, having finished third in the same race last year. Senior Timmy Andrews (16:25.1) and junior Keenan Fraylick (16:35.6) also ran career-best times on the day. Although the boys actually accumulated 17 less points than their 2014 counterparts (77 and 94, respectively), they nevertheless fell short to a surprising Lexington squad, which ran their best race of the year to take the team crown. The Red Devils’ mark also represented the lowest team total scored at the state championship since the 1975 edition, which accrued a scant 65. It also was the lowest score not to win the Division II boys’ team title since 1989, when Swanton compiled 76 points, only to fall short by five to Sandusky Perkins. The girls’ team continued their postseason hot streak, finishing second in the state and improving seven places as a team, despite losing three scorers from last season’s finals. Sophomore Makenzie Dietz slogged through tough course conditions to set a personal best of 19:40.1, the only member of her team to do so, despite an excellent overall team performance. The girls lost to a dominant Lexington team, which had been heavily favored to win the state title throughout the year. However, they Devils slipped ahead of several other well-regarded teams, including regional rival Alter, with whom they had dueled during each preceding round of the postseason. The girls’ pack, which had proved to be the strength of the team ever since an eye-opening victory in the Division I section of the Alliance Running Invitational, ran together again, recording the narrowest 1-5 spread (15.6 seconds) of any girls team in any division. The 125 points they scored was the lowest total at the state championship in program history. Congratulations to all of the athletes who competed in the race on a great performance, to everyone involved in Tippecanoe cross country for a great season, and to all of the programs seniors for their unfaltering efforts and for the triumphs which followed over the four years of their stellar careers. 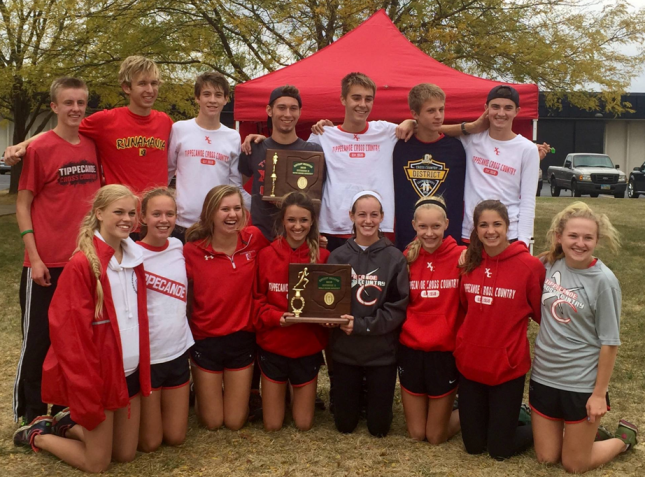 For only the 2nd time in school history, both the girls and boys teams swept the Regional Meet. The Red Devils also had an impressive 7 individual State qualifiers (top 16). Once again, the Lady Devils were faced State powerhouses Archbishop Alter, Oakwood, and Springfield-Shawnee. They responded with a strong victory and a 58 point team score. Kaili Titley (8th, 19:20), Abbi Halsey (10th, 19:24), Laura Fink (12th, 19:31), and Katie Taylor (14th, 19:33) advanced to State as individuals. This is the most girls in the top 16 that Tippecanoe has ever had in one year. Following their lead were Stephanie Fink (19th, 19:43), Makenzie Dietz (33rd, 20:23), and Emily Wolfe (37th, 20:28). The boys team obtained the Regional Title for the 3rd consecutive year and had one of their strongest team performances of the season, scoring only 40 points and having their 7th runner ahead of any team’s 3rd. Mitchell Poynter snatched his 3rd individual Regional Title (15:39). Thomas Chaney (9th, 16:22) and Spencer Ranft (14th, 16:31) earned the honor of being State qualifiers. Keenan Fraylick (18th, 16:39), Jacob Stillwagon (21st, 16:45), Tim Andrews (22nd, 16:46), and Jordan Brown (23rd, 16:48) rounded out the Regional Championship team. 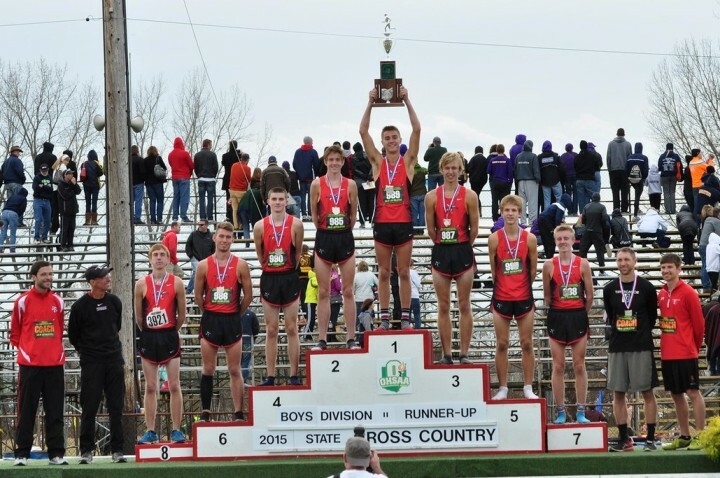 The OHSAA State Championship Meet is the final race of the Red Devils’ 2015 season, and will take place at National Trail Raceway on November 7th. With 13 runners qualifying to Regionals individually and two team titles, the girls (ranked #4 in the State) and boys (ranked #2) dominated the Dayton District Meet. The District Race promised to be a difficult one for the girls. Their competition included the #2 State-ranked team Archbishop Alter, Oakwood (#7), and Springfield-Shawnee (#11). However, they accepted the challenge and won with a 43 point team score. All 7 girls advanced to the Regional Meet as individuals: Kaili Titley (6th, 19:31), Abbi Halsey (7th, 19:36), Katie Taylor (8th, 19:44), Laura Fink (9th, 19:49), Stephanie Fink (13th, 20:17), Emily Wolfe (15th, 20:23), and Makenzie Dietz (16th, 20:31). Going into the race, the boys knew that no team was going to contest them, but this didn't stop them from putting in exceptional effort. For this, they became District Champions for the 3rd year running. Spearheading the boys and winning the race was returning District Champion Mitchell Poynter (16:08). Thomas Chaney (6th, 16:51), Keenan Fraylick (9th, 17:00), Tim Andrews (11th, 17:06), Spencer Ranft (15th, 17:14), Jordan Brown (16th, 17:16), and Jacob Stillwagon (35th, 17:47) rounded out the boys' top 7. The Red Devils of Tippecanoe finished off their last year in the Central Buckeye Conference with a bang and left with 3 team titles, 19 Honorable Mention (top 28), and 21 All-CBC (top 14) runners. Grace Litette (25th), Sydney Lange (20th), Bailee Hoover (18th), and Cat Owen (17th) were Honorable Mention All-CBC in the junior high girls race. 4 more girls achieved All-CBC honors: Reece Angell (11th), Amelia Zweizig (10th), Katie Reeder (8th), and Mackenzie Dix (5th). With a team score of 51, they won their race for the 2nd year in a row. Of the 14 available Honorable Mention All-CBC spots, the junior high boys took 10 of them. Aaron Davis (9th), Brennan Larned (7th), and Bryce Conley (3rd) received All-CBC titles. Despite their commendable effort and finishes, Springfield-Shawnee edged them out by 3 points, making the Red Devils Conference runner-ups. Bekah Shininger (27th) and Emily Wolfe (15th) earned Honorable Mention status for the Lady Red Devils. Running All-CBC were Makenzie Dietz (12, 20:23), Jillian Brown (11th, 20:12), Stephanie Fink (7th, 19:30), Laura Fink (5th, 19:18), Abbi Halsey (4th, 19:09), Katie Taylor (3rd, 19:09), and Kaili Titley (2nd, 19:09). The girls settled and old rivalry and took the team title against State-ranked Springfield-Shawnee after losing to them in 2014 by 1 point. In the high school boys race, Noah Ballard (27th), Sam Brumfield (20th), and Michael Stearns (18th) obtained Honorable Mention status. Half of the All-CBC runners in the race were from Tippecanoe: Spencer Ranft (13th, 16:57), Jacob Stillwagon (9th, 16:40), Keenan Fraylick (8th, 16:40), Jordan Brown (7th, 16:38), Tim Andrews (5th, 16:26), and Thomas Chaney (4th, 16:22). Mitchell Poynter won by 34 seconds with his 15:28. Their efforts led to a Conference title for the 4th consecutive year. The Red Devils’ State campaign begins next Saturday, October 24th, at the Miami Valley CTC District Meet. 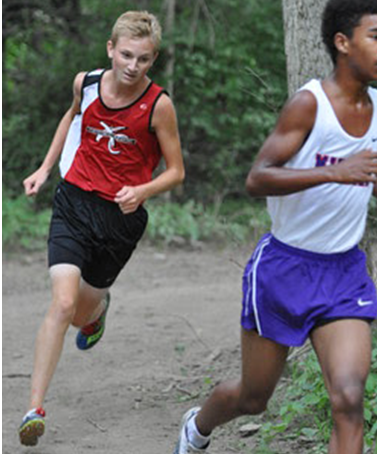 The Red Devils dominated their home meet at Kyle Park, a 2 mile race for both high school and junior high. Mackenzie Dix took 8th in the junior high race (13:22). The other scorers were well under 15:00. Their performances earned them 3rd place overall. The junior high boys took 2nd place and were only 13 points behind the very competitive team from Mason. Bryce Conley was the 6th boy to finish in an 11:23. For the first time this season, 5 boys ran under 12:00. The high school girls squad obliterated the competition and only scored 26 points. Kaili Titley became one of the only Tippecanoe girls to break 12:00 at the Tipp Invite (11:56) and finished in 3rd place. To add to this, Katie Taylor (4th, 12:03), Abbi Halsey (5th, 12:07), Laura Fink (6th, 12:08), and Stephanie Fink (8th, 12:18) also had incredible finishes. Makenzie Dietz (10th), Emily Wolfe (12th), and Jillian Brown (21st) were at 13:00 and under. The boys destroyed every team they faced, as well, with their team score of 30. Mitchell Poynter won his 4th race of the season (9:38), coming very close to beating the course record set by Sam Wharton (9:35). Jacob Stillwagon (4th, 10:14), Keenan Fraylick (6th, 10:16), Tim Andrews (9th, 10:21), and Thomas Chaney (10th, 10:21) rounded out their top 5, with Jordan Brown (13th, 10:28) and Spencer Ranft (16th, 10:33) not far behind. As only the top 12 runners can compete in the CBC meet, the seniors that had their last career race at the Tipp Invite are congratulated on their passion for running and cross country and are thanked for making the team what it is today. The Red Devils will be in action on October 17th, where they will be battling it out to earn the CBC Championship title. The rainy and cold conditions of the Miami County Championship Meet did not stop the Red Devils from proving that Tippecanoe has the best cross country program in the whole county. The junior high girls placed 2nd in their race. Katie Reeder had an excellent run, placing 4th with a time of 13:30. The top 5 girls, almost completely comprised of 7th graders, were all under 15:00. 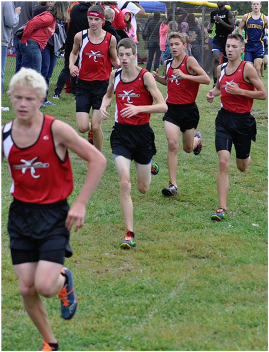 Tippecanoe's junior high boys took the team title for the first time in 3 years. Bryce Conley placed 3rd overall and ran an 11:29. They had an astounding 8 runners under 13:00. 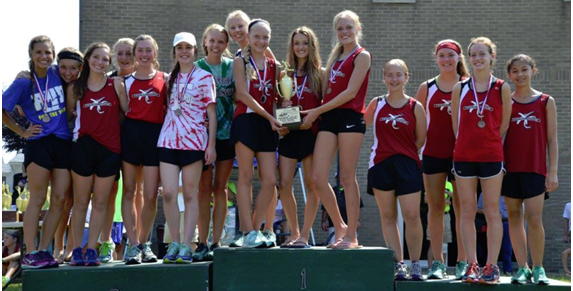 The high school girls edged out Troy by 7 points to become the county champions for the 7th consecutive year. In one of the best races in county history, they managed to get 5 girls in the top 10. Freshmen Kaili Titley (5th, 19:17) and Katie Taylor (6th, 19:22) took charge of the race. Laura Fink (7th, 19:23), Abbi Halsey (8th, 19:23), and Stephanie Fink (10th, 19:29) were not far behind, and made school history by being the first girls team to have 5 runners under 19:30. Rounding out the top 8 were Makenzie Dietz (11th, 19:54), Emily Wolfe (18th, 20:38), and Jillian Brown (20th, 20:55). Mitchell Poynter won the race for the 2nd year in a row (15:39) and led the boys to a team championship. A cluster of Tippecanoe runners took 7th-12th place: Jacob Stillwagon (16:45), Jordan Brown (16:46), Spencer Ranft (16:47), Thomas Chaney (16:48), Tim Andrews (16:49), and Michael Stearns (16:58). Separated by only 1 place, Keenan Fraylick was their 8th runner (17:04). In a very competitive county race, Tippecanoe had 10 runners in the top 20. At the McCallie Invitational, the Red Devils represented Ohio well with their fantastic times and finishes. The girls had a very low team score of 26 points, and all 7 runners finished in the top 20. Kaili Titley finished 3rd and earned a spot on the record board with a 19:27. Katie Taylor (4th, 19:36), Abbi Halsey (19:37, 5th), and Laura Fink (6th, 19:38) also made their way on the record board. Behind them were Stephanie Fink (8th, 19:51), Makenzie Dietz (12th, 20:01), and Emily Wolfe (18th, 20:29). Together, they make one of the best girls teams Tippecanoe has ever assembled. The boys ran very impressively, but were 2 points short of first place. Mitchell Poynter earned first place honors with a 15:43. Tippecanoe had four more boys run under 17 minutes: Jacob Stillwagon (9th, 16:33), Spencer Ranft (13th, 16:39), Thomas Chaney (14th, 16:39), and Tim Andrews (18th, 16:43). Jordan Brown (24th, 17:03) and Michael Stearns (27th, 17:05) were very close behind. The boys continue to show the state that they can be just as competitive as last year. The Miami County Championship meet is next on the agenda for the Red Devils on October 3rd. 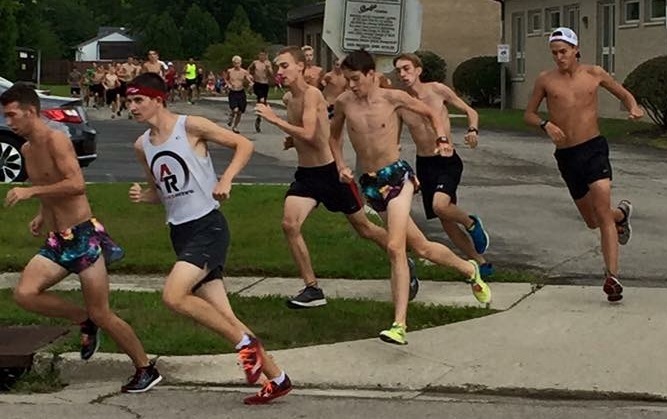 At the Alliance Running Invitational, Tippecanoe stayed true to the race’s mantra and very strongly in all six races they entered. Coach Kimmel owns the timing company, Alliance Running, which sponsors this huge and highly competitive meet. Mackenzie Dix finished first for the girls junior high team in 21st place out of 244 runners (13:41). The top five for the girls were under 14:30. They finished 4th in their 15 team race. Bryce Conley continued his amazing streak with 11:24, 3rd out of 272 runners. Aaron Davis and Brennan Larned also ran under 12 minutes (12th and 14th place). The boys won the race in a 23 team field. Although Tippecanoe is a Division II school, the top 10 runners competed in the Division I Varsity Race and the JV ran the Division II Varsity Race. 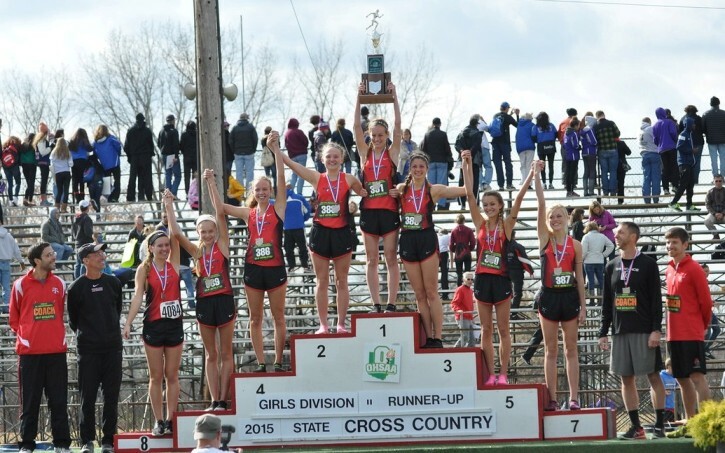 By their finishes, it’s clear that Tippecanoe has no shortage of excellent runners. The JV girls, in a 21 team race, were able to claim 8th place. Bekah Shininger was the first to finish for the girls (22:43, 47th). Behind her was the close pack of Kelly Rhoades (23:00), Annie Martino (23:02), Kayla Bruns (23:07), and Autumn Weldon (23:28). Ethan Sinning (18:11, 32nd) led the JV boys to a 7th place finish out of the 23 teams that ran. Ethan Heitkamp (18:21), Andrew Doviak (18:33), Colin Durcan (18:35), and Matthew Poynter (18:40) also scored for the Red Devils. Sporting their new uniforms, the first 5k of 2015 where both varsity squads raced was one to remember. The girls varsity had one of the best races in school history. They proved that they were a force to be reckoned with by placing 1st, defeating 2nd place by 68 points. The tight pack of Kaili Titley (19:49, 5th), Abbi Halsey (19:52, 6th), Katie Taylor (19:57, 7th), Laura Fink (19:59, 9th), and Stephanie Fink (20:05, 10th) scored 37 points. Also running for the varsity girls were Makenzie Dietz, Emily Wolfe, Jillian Brown, Anna Klepinger, and Allison Mader. The top 8 girls placed in the top 21. Had Archbishop Alter (currently ranked 2nd in the state) run in Division I, Tippecanoe would’ve had 8 girls in front of their 5th and had a great chance of beating their rivals. The boys asserted their dominance and let no one forget that they were the returning state champions. Mitchell Poynter was the runner-up of the race (15:57) and was edged out by one of the best young runners in the nation. Tim Andrews (16:42, 8th), Spencer Ranft (16:48, 9th), Thomas Chaney (16:52, 12th), and Jacob Stillwagon (17:03, 17th) utilized their many years of experience for a 2nd place team finish behind Dublin Coffman (ranked 8th in Division I) by a scant 9 points. 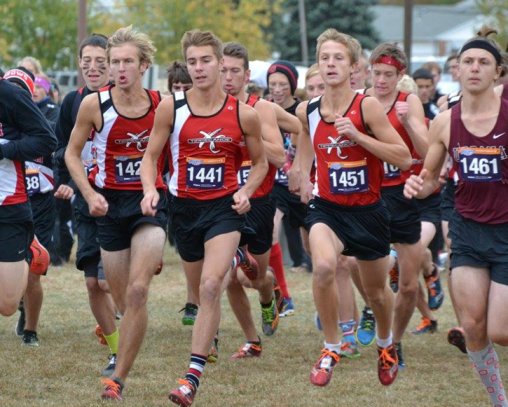 Michael Stearns, Keenan Fraylick, Jordan Brown, Ben Jans, and Sam Brumfield had outstanding finishes for Tippecanoe as well – 8 boys placed in the top 25. The Red Devils took full advantage of the cool temperatures and flat course at the Blue Devil Invitational and had great individual and team finishes. This was the final race of the season that Coach Kimmel decided to hold the boys varsity team. Instead, they helped pace their fellow teammates to excellent finishes. Michael Stearns was the first to cross the finish line for the boys (3rd, 17:15). The next scorers finished in an astounding pack: Keenan Fraylick (13th, 17:55), Ben Jans (14th, 17:56), Noah Ballard (15th, 17:58), and Ethan Sinning (16th, 17:59). They were the only team of the day to have their top five break 18 minutes. The JV fell short to Oakwood’s varsity team by 11 points. Like the Greenville Invitational, the girls varsity squad was split. Of the top eight runners, three raced full-out, and the others paced. Abbi Halsey was the runner-up of the race in a 19:44. Rounding out the top five were Laura Fink (3rd, 19:51), Makenzie Dietz (7th, 20:55), Annie Martino (15th, 21:52), and Anna Klepinger (22nd, 22:09). The girls, too, were defeated by Oakwood. Tippecanoe will have a chance to avenge these losses to Regional rivals Oakwood next week with all of the varsity runners. The junior high teams both won their races for the third meet in a row. Bryce Conley led the boys to their victory with a fourth place finish. In his fourth career race, he is already ranked 8th on the junior high record board with his PR of 11:22. Two more boys for Tippecanoe received sub 12 minute honors. Mackenzie Dix ran 13:34 to finish 6th place overall and first for the team. Impressively, Tippecanoe’s 7th runner finished ahead of every team’s 5th runner. Coach Kimmel’s own Alliance Running Invitational on September 19th is next for the Red Devils. The JV teams are racing in the DII Varsity Race, and the full varsity squads are entering the DI Varsity Race. The Red Devils persevered through the hot, humid conditions of the Greenville Invitational and left with many ribbons, medals, and trophies. The top boys squad, again, was chosen not to race. However, strong finishes by the junior varsity team allowed them to compete very well in the DII Varsity Race. Ben Jans ran an 18:44 to earn him 4th place honors and finish first for Tippecanoe. The other four boys to score were Noah Ballard (7th), Adam Rindler (8th), Josh May (9th), and Ethan Sinning (10th). They fell short by a scant three points to Versailles, but were still able to secure a second place finish. On the girls side, all but three of the top runners competed. Kaili Titley was the only Red Devil of the day to win their race (20:08). Closely behind her were Katie Taylor (2nd), Stephanie Fink (4th), Jillian Brown (5th), and Emily Wolfe (8th). Tippecanoe took the DII Varsity Race title, sweeping the field by 16 points. The junior high teams upheld Tippecanoe's excellence in their individual and team finishes. Bryce Conley took charge of the boys race, going sub 12 and earning 2nd place. Tippecanoe took the first place trophy and won by 32 points in the 18 team field. Mackenzie Dix secured a 9th place finish by running a 14:02. Supported by great finishes from her teammates, the girls won the junior high race with a 20 point victory. Catch the Red Devils on September 12th at the Brookville Invitational. 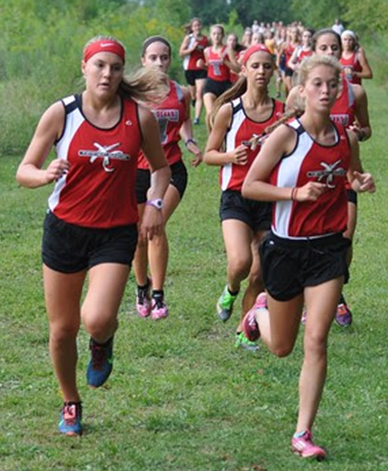 With both varsity squads unleashed, Tippecanoe swept the two mile Lost Creek Invitational. Mitchell Poynter won the boys race with a blazing time of 9:31. Tim Andrews (4th), Thomas Chaney (5th), Spencer Ranft (6th), and Jordan Brown (9th), came closely afterward. Seven boys ran under 11 minutes for Tippecanoe. The team score won the race by 60 points. Freshmen Kaili Titley (2nd), and Katie Taylor (3rd), took charge in their first high school race, running respective times of 12:16 and 12:19. Following their lead were Makenzie Dietz (4th), Abbi Halsey (5th), and Laura Fink (6th). Eight girls were able to break the 13 minute barrier. They dominated the race with a low team score of 20 points and beat the second place finishers by 32 points. The junior high finished just as strongly and showcased their promise as up-and-coming high school standouts. On the boys side, Bryce Conley lead their way to victory with a 2nd place finish (11:39). The other scorers were well under 13 minutes, and with a team score of 33, they won by 37 points. Katie Reeder finished 3rd (13:52) and was closely followed by four more girls, all of them breaking 15 minutes. Their efforts accumulated to an 18 point victory over second place. Next for Tippecanoe is the Greenville Invitational on September 5th. 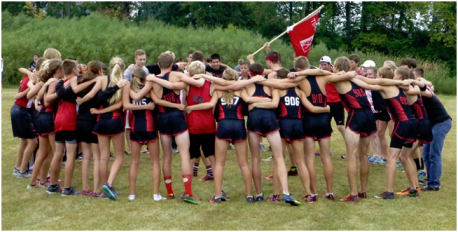 The depth of Tippecanoe Cross Country was highlighted at the 2015 Bob Schul Invitational. The top runners didn't enter the race, but this didn't stop the junior varsity teams from competing very well against other schools' best runners. Michael Stearns spearheaded the boys team, with an 11th place finish in a field of almost 400 runners, and ran an impressive 17:08. Following Stearns was Noah Ballard (18:12), Ben Jans (18:19), Ethan Sinning (18:19), and Adam Rindler (18:34). The boys placed 4th in a 30 team race. The first girl to cross the finish line for Tippecanoe was Anna Klepinger, in a 21:42. Rounding out the top five were Annie Martino (21:55), Allison Mader (22:37), Kelly Rhoades (23:13), and Kayla Bruns (23:20). Their combined efforts earned the girls 11th place honors out of 29 teams. In the two mile, the success of the high school was not left unparalleled for Tippecanoe. In an enormous race of 465 runners, Bryce Conley lead the boys with a 9th place finish (11:34). The girls top runner was Katie Reeder, finishing 25th (13:35). Both teams earned 3rd place honors out of 50 schools. Next for the Red Devils is the Lost Creek Invitational on September 1st. Fresh off two state appearances, the Tippecanoe Red Devils are gearing up for the 2015 cross country season. Both runners and coaches performed well at the St. Chris 5k, a final tune-up before the Bob Schul Invitational on August 29. The Varsity Assistant Jason Salyer won the race, as well as set the course record in a 15:22. Every coach won his age division. Senior Mitchell Poynter led the men's team and ran a 15:48, earning second place honors. Runners 2-6, the seniors returning from the 2014 state championship team, finished in a pack and all broke 17:00. Abbi Halsey, entering her junior year, was the first to finish for the girls with a time of 19:24. Supporting this blazing finish, three more girls ran under 20:00. The underclassmen shined in this race, as 6 of the top 8 were freshmen and sophomores. Races like these promise great things for the upcoming season. Surely the whole state will be watching out for Tippecanoe cross country.